Decompression modeling attempts to explain and predict the mechanism of gas elimination and bubble formation within the organism during and after changes in ambient pressure, and provides mathematical models which attempt to predict acceptably low risk and reasonably practicable procedures for decompression in the field. Both deterministic and probabalistic models have been used, and are still in use. The absorption of gases in liquids depends on the solubility of the specific gas in the specific liquid, the concentration of gas, customarily measured by partial pressure, and temperature. In the study of decompression theory the behaviour of gases dissolved in the tissues is investigated and modeled for variations of pressure over time. Solubility of gases in liquids is influenced by the nature of the solvent liquid and the solute, the temperature, pressure, and the presence of other solutes in the solvent. Diffusion is faster in smaller, lighter molecules of which helium is the extreme example. Diffusivity of helium is 2.65 times faster than nitrogen. The concentration gradient, can be used as a model for the driving mechanism of diffusion. In this context, inert gas refers to a gas which is not metabolically active. Atmospheric nitrogen (N2) is the most common example, and helium (He) is the other inert gas commonly used in breathing mixtures for divers. Atmospheric nitrogen has a partial pressure of approximately 0.78 bar at sea level. Air in the alveoli of the lungs is diluted by saturated water vapour (H2O) and carbon dioxide (CO2), a metabolic product given off by the blood, and contains less oxygen (O2) than atmospheric air as some of it is taken up by the blood for metabolic use. The resulting partial pressure of nitrogen is about 0,758 bar. At atmospheric pressure the body tissues are therefore normally saturated with nitrogen at 0.758 bar (569 mmHg). At increased ambient pressures due to depth or habitat pressurisation, a diver's lungs are filled with breathing gas at the increased pressure, and the partial pressures of the constituent gases will be increased proportionately. The inert gases from the breathing gas in the lungs diffuse into blood in the alveolar capillaries and are distributed around the body by the systemic circulation in the process known as perfusion. Dissolved materials are transported in the blood much faster than they would be distributed by diffusion alone. From the systemic capillaries the dissolved gases diffuse through the cell membranes and into the tissues, where it may eventually reach equilibrium. The greater the blood supply to a tissue, the faster it will reach equilibrium with gas at the new partial pressure. This equilibrium is called saturation. Ingassing appears to follow a simple inverse exponential equation. The time it takes for a tissue to take up or release 50% of the difference in dissolved gas capacity at a changed partial pressure is called the half-time for that tissue and gas. Gas remains dissolved in the tissues until the partial pressure of that gas in the lungs is reduced sufficiently to cause a concentration gradient with the blood at a lower concentration than the relevant tissues. As the concentration in the blood drops below the concentration in the adjacent tissue, the gas will diffuse out of the tissue into the blood, and will then be transported back to the lungs where it will diffuse into the lung gas and then be eliminated by exhalation. If the ambient pressure reduction is limited, this desaturation will take place in the dissolved phase, but if the ambient pressure is lowered sufficiently, bubbles may form and grow, both in blood and other supersaturated tissues. When the partial pressure of all gas dissolved in a tissue exceeds the total ambient pressure on the tissue it is supersaturated, and there is a possibility of bubble formation. The sum of partial pressures of the gas that the diver breathes must necessarily balance with the sum of partial pressures in the lung gas. In the alveoli the gas has been humidified and has gained carbon dioxide from the venous blood. Oxygen has also diffused into the arterial blood, reducing the partial pressure of oxygen in the alveoli. As the total pressure in the alveoli must balance with the ambient pressure, this dilution results in an effective partial pressure of nitrogen of about 758 mb (569 mmHg) in air at normal atmospheric pressure. At a steady state, when the tissues have been saturated by the inert gases of the breathing mixture, metabolic processes reduce the partial pressure of the less soluble oxygen and replace it with carbon dioxide, which is considerably more soluble in water. In the cells of a typical tissue, the partial pressure of oxygen will drop, while the partial pressure of carbon dioxide will rise. The sum of these partial pressures (water, oxygen, carbon dioxide and nitrogen) is less than the total pressure of the respiratory gas. This is a significant saturation deficit, and it provides a buffer against supersaturation and a driving force for dissolving bubbles. Experiments suggest that the degree of unsaturation increases linearly with pressure for a breathing mixture of fixed composition, and decreases linearly with fraction of inert gas in the breathing mixture. As a consequence, the conditions for maximising the degree of unsaturation are a breathing gas with the lowest possible fraction of inert gas – i.e. pure oxygen, at the maximum permissible partial pressure. This saturation deficit is also referred to as inherent unsaturation, the "Oxygen window". or partial pressure vacancy. The location of micronuclei or where bubbles initially form is not known. The incorporation of bubble formation and growth mechanisms in decompression models may make the models more biophysical and allow better extrapolation. Flow conditions and perfusion rates are dominant parameters in competition between tissue and circulation bubbles, and between multiple bubbles, for dissolved gas for bubble growth. Equilibrium of forces on the surface is required for a bubble to exist. The sum of the Ambient pressure and pressure due to tissue distortion, exerted on the outside of the surface, with surface tension of the liquid at the interface between the bubble and the surroundings must be balanced by the pressure on the inside of the bubble. This is the sum of the partial pressures of the gases inside due to the net diffusion of gas to and from the bubble. The force balance on the bubble may be modified by a layer of surface active molecules which can stabilise a microbubble at a size where surface tension on a clean bubble would cause it to collapse rapidly, and this surface layer may vary in permeability, so that if the bubble is sufficiently compressed it may become impermeable to diffusion. If the solvent outside the bubble is saturated or unsaturated, the partial pressure will be less than in the bubble, and the surface tension will be increasing the internal pressure in direct proportion to surface curvature, providing a pressure gradient to increase diffusion out of the bubble, effectively "squeezing the gas out of the bubble", and the smaller the bubble the faster it will get squeezed out. A gas bubble can only grow at constant pressure if the surrounding solvent is sufficiently supersaturated to overcome the surface tension or if the surface layer provides sufficient reaction to overcome surface tension. Clean bubbles that are sufficiently small will collapse due to surface tension if the supersaturation is low. Bubbles with semipermeable surfaces will either stabilise at a specific radius depending on the pressure, the composition of the surface layer, and the supersaturation, or continue to grow indefinitely, if larger than the critical radius. Bubble formation can occur in the blood or other tissues. A solvent can carry a supersaturated load of gas in solution. Whether it will come out of solution in the bulk of the solvent to form bubbles will depend on a number of factors. Something which reduces surface tension, or adsorbs gas molecules, or locally reduces solubility of the gas, or causes a local reduction in static pressure in a fluid may result in a bubble nucleation or growth. This may include velocity changes and turbulence in fluids and local tensile loads in solids and semi-solids. Lipids and other hydrophobic surfaces may reduce surface tension (blood vessel walls may have this effect). Dehydration may reduce gas solubility in a tissue due to higher concentration of other solutes, and less solvent to hold the gas. Another theory presumes that microscopic bubble nuclei always exist in aqueous media, including living tissues. These bubble nuclei are spherical gas phases that are small enough to remain in suspension yet strong enough to resist collapse, their stability being provided by an elastic surface layer consisting of surface-active molecules which resists the effect of surface tension. Once a micro-bubble forms it may continue to grow if the tissues are sufficiently supersaturated. As the bubble grows it may distort the surrounding tissue and cause damage to cells and pressure on nerves resulting in pain, or may block a blood vessel, cutting off blood flow and causing hypoxia in the tissues normally perfused by the vessel. Bubbles can also damage the vascular endothelium through ischemia and reperfusion, physical contact with the endothelium or by physical deformation. This damage may release endothelial membrane microparticles. Decompression bubbles appear to form mostly in the systemic capillaries where the gas concentration is highest, often those feeding the veins draining the active limbs. They do not generally form in the arteries provided that ambient pressure reduction is not too rapid, as arterial blood has recently had the opportunity to release excess gas into the lungs. The bubbles carried back to the heart in the veins may be transferred to the systemic circulation via a patent foramen ovale in divers with this septal defect, after which there is a risk of occlusion of capillaries in whichever part of the body they end up in. Bubbles which are carried back to the heart in the veins will pass into the right side of the heart, and from there they will normally enter the pulmonary circulation and pass through or be trapped in the capillaries of the lungs, which are around the alveoli and very near to the respiratory gas, where the gas will diffuse from the bubbles though the capillary and alveolar walls into the gas in the lung. If the number of lung capillaries blocked by these bubbles is relatively small, the diver will not display symptoms, and no tissue will be damaged (lung tissues are adequately oxygenated by diffusion). The bubbles which are small enough to pass through the lung capillaries may be small enough to be dissolved due to a combination of surface tension and diffusion to a lowered concentration in the surrounding blood, though the Varying Permeability Model nucleation theory implies that most bubbles passing through the pulmonary circulation will lose enough gas to pass through the capillaries and return to the systemic circulation as recycled but stable nuclei. Bubbles which form within the tissues must be eliminated in situ by diffusion, which implies a suitable concentration gradient. Superficial ICD (also known as Steady State Isobaric Counterdiffusion) occurs when the inert gas breathed by the diver diffuses more slowly into the body than the inert gas surrounding the body. An example of this would be breathing air in an heliox environment. The helium in the heliox diffuses into the skin quickly, while the nitrogen diffuses more slowly from the capillaries to the skin and out of the body. The resulting effect generates supersaturation in certain sites of the superficial tissues and the formation of inert gas bubbles. Deep Tissue ICD (also known as Transient Isobaric Counterdiffusion) occurs when different inert gases are breathed by the diver in sequence. The rapidly diffusing gas is transported into the tissue faster than the slower diffusing gas is transported out of the tissue. This can occur as divers switch from a nitrogen mixture to a helium mixture or when saturation divers breathing hydreliox switch to a heliox mixture. Doolette and Mitchell's study of Inner Ear Decompression Sickness (IEDCS) shows that the inner ear may not be well-modelled by common (e.g. Bühlmann) algorithms. Doolette and Mitchell propose that a switch from a helium-rich mix to a nitrogen-rich mix, as is common in technical diving when switching from trimix to nitrox on ascent, may cause a transient supersaturation of inert gas within the inner ear and result in IEDCS. They suggest that breathing-gas switches from helium-rich to nitrogen-rich mixtures should be carefully scheduled either deep (with due consideration to nitrogen narcosis) or shallow to avoid the period of maximum supersaturation resulting from the decompression. Switches should also be made during breathing of the largest inspired oxygen partial pressure that can be safely tolerated with due consideration to oxygen toxicity. Vascular bubbles formed in the systemic capillaries may be trapped in the lung capillaries, temporarily blocking them. If this is severe, the symptom called "chokes" may occur. If the diver has a patent foramen ovale (or a shunt in the pulmonary circulation), bubbles may pass through it and bypass the pulmonary circulation to enter the arterial blood. If these bubbles are not absorbed in the arterial plasma and lodge in systemic capillaries they will block the flow of oxygenated blood to the tissues supplied by those capillaries, and those tissues will be starved of oxygen. Moon and Kisslo (1988) concluded that "the evidence suggests that the risk of serious neurological DCI or early onset DCI is increased in divers with a resting right-to-left shunt through a PFO. There is, at present, no evidence that PFO is related to mild or late onset bends." The composition of the breathing gas during pressure exposure and decompression is significant in inert gas uptake and elimination for a given pressure exposure profile. Breathing gas mixtures for diving will typically have a different gas fraction of nitrogen to that of air. The partial pressure of each component gas will differ to that of nitrogen in air at any given depth, and uptake and elimination of each inert gas component is proportional to the actual partial pressure over time. The two foremost reasons for use of mixed breathing gases are the reduction of nitrogen partial pressure by dilution with oxygen, to make Nitrox mixtures, primarily to reduce the rate of nitrogen uptake during pressure exposure, and the substitution of helium (and occasionally other gases) for the nitrogen to reduce the narcotic effects under high partial pressure exposure. Depending on the proportions of helium and nitrogen, these gases are called Heliox, if there is no nitrogen, or Trimix, if there is nitrogen and helium along with the essential oxygen. The inert gases used as substitutes for nitrogen have different solubility and diffusion characteristics in living tissues to the nitrogen they replace. For example, the most common inert gas diluent substitute for nitrogen is helium, which is significantly less soluble in living tissue, but also diffuses faster due to the relatively small size and mass of the He atom in comparison with the N2 molecule. Blood flow to skin and fat are affected by skin and core temperature, and resting muscle perfusion is controlled by the temperature of the muscle itself. During exercise increased flow to the working muscles is often balanced by reduced flow to other tissues, such as kidneys spleen and liver. Blood flow to the muscles is also lower in cold water, but exercise keeps the muscle warm and flow elevated even when the skin is chilled. Blood flow to fat normally increases during exercise, but this is inhibited by immersion in cold water. Adaptation to cold reduces the extreme vasoconstriction which usually occurs with cold water immersion. Variations in perfusion distribution do not necessarily affect respiratory inert gas exchange, though some gas may be locally trapped by changes in perfusion. Rest in a cold environment will reduce inert gas exchange from skin, fat and muscle, whereas exercise will increase gas exchange. Exercise during decompression can reduce decompression time and risk, providing bubbles are not present, but can increase risk if bubbles are present. Inert gas exchange is least favourable for the diver who is warm and exercises at depth during the ingassing phase, and rests and is cold during decompression. Other factors which can affect decompression risk include oxygen concentration, carbon dioxide levels, body position, vasodilators and constrictors, positive or negative pressure breathing. and dehydration (blood volume). Individual susceptibility to decompression sickness has components which can be attributed to a specific cause, and components which appear to be random. The random component makes successive decompressions a poor test of susceptibility. Obesity and high serum lipid levels have been implicated by some studies as risk factors, and risk seems to increase with age. Another study has also shown that older subjects tended to bubble more than younger subjects for reasons not yet known, but no trends between weight, body fat, or gender and bubbles were identified, and the question of why some people are more likely to form bubbles than others remains unclear. Early decompression models tended to use the dissolved phase models, and adjusted them by more or less arbitrary factors to reduce the risk of symptomatic bubble formation. Dissolved phase models are of two main groups. Parallel compartment models, where several compartments with varying rates of gas absorption (half time), are considered to exist independently of each other, and the limiting condition is controlled by the compartment which shows the worst case for a specific exposure profile. These compartments represent conceptual tissues and are not intended to represent specific organic tissues, merely to represent the range of possibilities for the organic tissues. The second group uses serial compartments, where gas is assumed to diffuse through one compartment before it reaches the next. A recent variation on the serial compartment model is the Goldman interconnected compartment model (ICM). 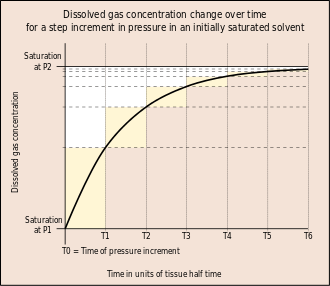 The half time of a tissue is the time it takes for the tissue to take up or release 50% of the difference in dissolved gas capacity at a changed partial pressure. For each consecutive half time the tissue will take up or release half again of the cumulative difference in the sequence ½, ¾, 7/8, 15/16, 31/32, 63/64 etc. Tissue compartment half times range from 1 minute to at least 720 minutes. A specific tissue compartment will have different half times for gases with different solubilities and diffusion rates. Ingassing is generally modeled as following a simple inverse exponential equation where saturation is assumed after approximately four (93.75%) to six (98.44%) half-times depending on the decompression model. This model may not adequately describe the dynamics of outgassing if gas phase bubbles are present. J.S. Haldane originally used a critical pressure ratio of 2 to 1 for decompression on the principle that the saturation of the body should at no time be allowed to exceed about double the air pressure. This principle was applied as a pressure ratio of total ambient pressure and did not take into account the partial pressures of the component gases of the breathing air. His experimental work on goats and observations of human divers appeared to support this assumption. However, in time, this was found to be inconsistent with incidence of decompression sickness and changes were made to the initial assumptions. This was later changed to a 1.58:1 ratio of nitrogen partial pressures. Further research by people such as Robert Workman suggested that the criterion was not the ratio of pressures, but the actual pressure differentials. Applied to Haldane's work, this would suggest that the limit is not determined by the 1.58:1 ratio but rather by the critical difference of 0.58 atmospheres between tissue pressure and ambient pressure. Most tables today, including the Bühlmann tables, are based on the critical difference model. Gradient factors are a way of modifying the M-value to a more conservative value for use in a decompression algorithm. The gradient factor is a percentage of the M-value chosen by the algorithm designer, and varies linearly between the maximum depth and the surface. They are expressed as a two number designation, where the first number is the percentage of the deep M-value, and the second is a percentage of the shallow M-value. The gradient factors are applied to all tissue compartments equally and produce an M-value which is linearly variable in proportion to ambient pressure. The critical ratio hypothesis predicts that the development of bubbles will occur in a tissue when the ratio of dissolved gas partial pressure to ambient pressure exceeds a particular ratio for a given tissue. The ratio may be the same for all tissue compartments or it may vary, and each compartment is allocated a specific critical supersaturation ratio, based on experimental observations. John Scott Haldane introduced the concept of half times to model the uptake and release of nitrogen into the blood. He suggested 5 tissue compartments with half times of 5, 10, 20, 40 and 75 minutes. In this early hypothesis it was predicted that if the ascent rate does not allow the inert gas partial pressure in each of the hypothetical tissues to exceed the environmental pressure by more than 2:1 bubbles will not form. Basically this meant that one could ascend from 30 m (4 bar) to 10 m (2 bar), or from 10 m (2 bar) to the surface (1 bar) when saturated, without a decompression problem. To ensure this a number of decompression stops were incorporated into the ascent schedules. The ascent rate and the fastest tissue in the model determine the time and depth of the first stop. Thereafter the slower tissues determine when it is safe to ascend further. This 2:1 ratio was found to be too conservative for fast tissues (short dives) and not conservative enough for slow tissues (long dives). The ratio also seemed to vary with depth. Haldane's approach to decompression modeling was used from 1908 to the 1960s with minor modifications, primarily changes to the number of compartments and half times used. The 1937 US Navy tables were based on research by O. D. Yarbrough and used 3 compartments: the 5- and 10-minute compartments were dropped. In the 1950s the tables were revised and the 5- and 10-minute compartments restored, and a 120-minute compartment added. In the 1960s Robert D. Workman of the U.S. Navy Experimental Diving Unit (NEDU) reviewed the basis of the model and subsequent research performed by the US Navy. Tables based on Haldane's work and subsequent refinements were still found to be inadequate for longer and deeper dives. Workman proposed that the tolerable change in pressure was better described as a critical pressure difference, and revised Haldane's model to allow each tissue compartment to tolerate a different amount of supersaturation which varies with depth. He introduced the term "M-value" to indicate the maximum amount of supersaturation each compartment could tolerate at a given depth and added three additional compartments with 160, 200 and 240-minute half times. Workman presented his findings as an equation which could be used to calculate the results for any depth and stated that a linear projection of M-values would be useful for computer programming. A large part of Albert A. Bühlmann's research was to determine the longest half time compartments for Nitrogen and Helium, and he increased the number of compartments to 16. He investigated the implications of decompression after diving at altitude and published decompression tables that could be used at a range of altitudes. Bühlmann used a method for decompression calculation similar to that proposed by Workman, which included M-values expressing a linear relationship between maximum inert gas pressure in the tissue compartments and ambient pressure, but based on absolute pressure, which made them more easily adapted for altitude diving. Bühlmann's algorithm was used to generate the standard decompression tables for a number of sports diving associations, and is used in several personal decompression computers, sometimes in a modified form. B.A. Hills and D.H. LeMessurier studied the empirical decompression practices of Okinawan pearl divers in the Torres Strait and observed that they made deeper stops but reduced the total decompression time compared with the generally used tables of the time. Their analysis strongly suggested that bubble presence limits gas elimination rates, and emphasized the importance of inherent unsaturation of tissues due to metabolic processing of oxygen. This became known as the thermodyamic model. More recently, recreational technical divers developed decompression procedures using deeper stops than required by the decompression tables in use. These led to the RGBM and VPM bubble models. A deep stop was originally an extra stop introduced by divers during ascent, at a greater depth than the deepest stop required by their computer algorithm. There are also computer algorithms that are claimed to use deep stops, but these algorithms and the practice of deep stops have not been adequately validated. A "Pyle stop" is a deep stop named after Richard Pyle, an early advocate of deep stops, at the depths half way between the bottom and the first conventional decompression stop, and half way between the previous Pyle stop and the deepest conventional stop, provided the conventional stop is more than 9m shallower. a Pyle stop is about 2 minutes long. The additional ascent time required for Pyle stops is included in the dive profile before finalising the decompression schedule. Pyle found that on dives where he stopped periodically to vent the swim-bladders of his fish specimens, he felt better after the dive, and based the deep stop procedure on the depths and duration of these pauses. The hypothesis is that these stops provide an opportunity to eliminate gas while still dissolved, or at least while the bubbles are still small enough to be easily eliminated, and the result is that there will be considerably fewer or smaller venous bubbles to eliminate at the shallower stops as predicted by the thermodynamic model of Hills. The assumption that diffusion is the limiting mechanism of dissolved gas transport in the tissues results in a rather different tissue compartment model. 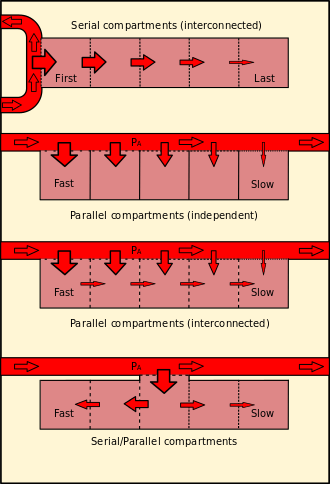 In this case a series of compartments has been postulated, with perfusion transport into one compartment, and diffusion between the compartments, which for simplicity are arranged in series, so that for the generalised compartment, diffusion is to and from only the two adjacent compartments on opposite sides, and the limit cases are the first compartment where the gas is supplied and removed via perfusion, and the end of the line, where there is only one neighbouring compartment. 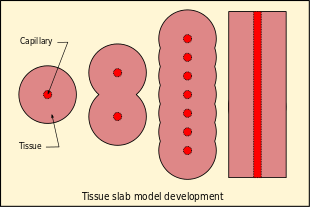 The simplest series model is a single compartment, and this can be further reduced to a one-dimensional "tissue slab" model. In contrast to the independent parallel compartments of the Haldanean models, in which all compartments are considered risk bearing, the Goldman model posits a relatively well perfused "active" or "risk-bearing" compartment in series with adjacent relatively poorly perfused "reservoir" or "buffer" compartments, which are not considered potential sites for bubble formation, but affect the probability of bubble formation in the active compartment by diffusive inert gas exchange with the active compartment. During compression, gas diffuses into the active compartment and through it into the buffer compartments, increasing the total amount of dissolved gas passing through the active compartment. During decompression, this buffered gas must pass through the active compartment again before it can be eliminated. If the gas loading of the buffer compartments is small, the added gas diffusion through the active compartment is slow. The interconnected models predict a reduction in gas washout rate with time during decompression compared with the rate predicted for the independent parallel compartment model used for comparison. The Goldman model differs from the Kidd-Stubbs series decompression model in that the Goldman model assumes linear kinetics, where the K-S model includes a quadratic component, and the Goldman model considers only the central well-perfused compartment to contribute explicitly to risk, while the K-S model assumes all compartments to carry potential risk. The DCIEM 1983 model associates risk with the two outermost compartments of a four compartment series. The mathematical model based on this concept is claimed by Goldman to fit not only the Navy square profile data used for calibration, but also predicts risk relatively accurately for saturation profiles. A bubble version of the ICM model was not significantly different in predictions, and was discarded as more complex with no significant advantages. The ICM also predicted decompression sickness incidence more accurately at the low-risk recreational diving exposures recorded in DAN's Project Dive Exploration data set. The alternative models used in this study were the LE1 (Linear-Exponential) and straight Haldanean models. The Goldman model predicts a significant risk reduction following a safety stop on a low-risk dive and significant risk reduction by using nitrox (more so than the PADI tables suggest). It is important that any theory be validated by carefully controlled testing procedures. As testing procedures and equipment become more sophisticated, researchers learn more about the effects of decompression on the body. Initial research focused on producing dives that were free of recognizable symptoms of decompression sickness (DCS). With the later use of Doppler ultrasound testing, it was realized that bubbles were forming within the body even on dives where no DCI signs or symptoms were encountered. This phenomenon has become known as "silent bubbles". The US Navy 1956 tables were based on limits determined by external DCS signs and symptoms. Later researchers were able to improve on this work by adjusting the limitations based on Doppler testing. However the US Navy CCR tables based on the Thalmann algorithm also used only recognisable DCS symptoms as the test criteria. Since the testing procedures are lengthy and costly, it is common practice for researchers to make initial validations of new models based on experimental results from earlier trials. This has some implications when comparing models. Exposure to the various theories, models, tables and algorithms is needed to allow the diver to make educated and knowledgeable decisions regarding their personal decompression needs. Basic decompression theory and use of decompression tables is part of the theory component of training for commercial divers, and dive planning based on decompression tables, and the practice and field management of decompression is a significant part of the work of the diving supervisor. Recreational divers are trained in the theory and practice of decompression to the extent that the certifying agency specifies in the training standard for each certification. This may vary from a rudimentary overview sufficient to allow the diver to avoid decompression obligation for entry level divers, to competence in the use of several decompression algorithms by way of personal dive computers, decompression software, and tables for advanced technical divers. The detailed understanding of decompression theory is not generally required of either commercial or recreational divers. ↑ "Altitude-induced Decompression Sickness" (PDF). Federal Aviation Administration. Retrieved 21 February 2012. ↑ Gorman, Des. "Decompression theory" (PDF). Royal Australian Navy. Retrieved 9 February 2016. 1 2 3 Wienke, B.R. "Decompression theory" (PDF). Retrieved 9 February 2016. ↑ Young, C.L. ; Battino, R.; Clever, H.L. (1982). "The solubility of gases in liquids" (PDF). Retrieved 9 February 2016. ↑ P. Cohen, ed. (1989). The ASME handbook on Water Technology for Thermal Power Systems. The American Society of Mechanical Engineers. p. 442. ↑ Kasture, A.V. (October 2008). "5. Solubility of pharmaceiticals: Factors affecting solubility". Pharmaceutical Chemistry - I. Pragati Books Pvt. Ltd. p. 5.3. ISBN 9788185790121. Retrieved 7 March 2016. ↑ Burton, Steve (December 2004). "Isobaric Counter Diffusion". ScubaEngineer. Retrieved 3 February 2011. 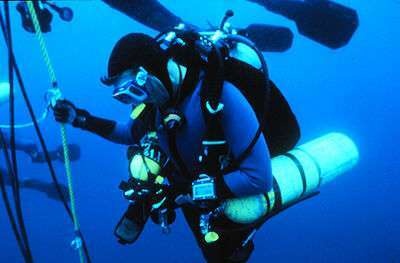 ↑ "15: Mixed gas and oxygen diving". The NOAA Diving Manual: Diving for Science and Technology (illustrated ed.). DIANE Publishing. 1992. p. 15.1. ISBN 9781568062310. Retrieved 8 March 2016. 1 2 Hills, Brian A (1978). "Effect of decompression per se on nitrogen elimination". J Appl Physiol. 45 (6): 916–921. PMID 730597. Retrieved 31 October 2011. 1 2 Pittman, RN (2011). "Chapter 2: The Circulatory System and Oxygen Transport". Regulation of Tissue Oxygenation. San Rafael (CA): Morgan & Claypool Life Sciences. ↑ Bookspan, Jolie (June 2005). "Are Tissue Halftimes Real?". DAN Mediucal articles. Divers Alert Network. Retrieved 8 March 2016. 1 2 Hills, Brian A (1978). "A fundamental approach to the prevention of decompression sickness". South Pacific Underwater Medicine Society Journal. 8 (2): 20–47. ISSN 0813-1988. OCLC 16986801. Retrieved 31 October 2011. ↑ Behnke, Albert R (1967). "The isobaric (oxygen window) principle of decompression". Trans. Third Marine Technology Society Conference, San Diego. The New Thrust Seaward. Washington DC: Marine Technology Society. Retrieved 19 June 2010. ↑ Van Liew, Hugh D; Conkin, J; Burkard, ME (1993). "The oxygen window and decompression bubbles: estimates and significance". Aviation, Space, and Environmental Medicine. 64 (9): 859–65. ISSN 0095-6562. PMID 8216150. 1 2 3 4 Papadopoulou, Virginie; Robert J. Eckersley; Costantino Balestra; Thodoris D. Karapantsios; Meng-Xing Tang (2013). "A critical review of physiological bubble formation in hyperbaric decompression". Advances in Colloid and Interface Science. Elsevier (191–192): 22–30. 1 2 Yount 1991, p. 131. ↑ Hills BA (March 1992). "A hydrophobic oligolamellar lining to the vascular lumen in some organs". Undersea Biomed Res. 19 (2): 107–20. PMID 1561717. Retrieved 31 October 2011. ↑ Tikuisis, P (1993). "Theoretical considerations for in vivo nucleation of bubbles". Abstract of the Undersea and Hyperbaric Medical Society, Inc. Annual Scientific Meeting held July 7–10, 1993. World Trade and Convention Centre, Halifax, Nova Scotia, Canada. Undersea and Hyperbaric Medical Society, Inc. Retrieved 8 March 2016. 1 2 3 4 5 6 Yount 1991. ↑ Campbell, Ernest S. (1997). "Decompression Illness in Sports Divers: Part I". Medscape Orthopaedics & Sports Medicine eJournal, 1(5). Orange Beach, Ala.: Medscape Portals, Inc. Retrieved 14 March 2016. ↑ Madden, Leigh A.; Laden, Gerard (2009). "Gas bubbles may not be the underlying cause of decompression illness – The at-depth endothelial dysfunction hypothesis" (PDF). Medical Hypotheses. Elsevier. pp. 389–392. Retrieved 14 March 2016. 1 2 3 4 Yount, David E. (2002). "Decompression theory - Bubble models : Applying VPM to diving" (PDF). Diving Science:. Deep Ocean Diving. p. 8. Retrieved 11 March 2016. ↑ Vann, Richard D (1989). "An overview". The Physiological Basis of Decompression. Undersea and Hyperbaric Medical Society. Retrieved 12 March 2016. 1 2 3 4 Stephenson, Jeffrey (2016). "Pathophysiology, treatment and aeromedical retrieval of SCUBA – related DCI". Journal of Military and Veterans' Health. Australasian Military Medicine Association. 17 (3). ISSN 1839-2733. 1 2 3 4 5 6 Lambertson, Christian J (1989). Relations of isobaric gas counterdiffusion and decompression gas lesion diseases. In Vann, RD. "The Physiological Basis of Decompression". 38th Undersea and Hyperbaric Medical Society Workshop UHMS Publication Number 75(Phys)6-1-89. http://archive.rubicon-foundation.org/6853. Retrieved 10 January 2010. 1 2 3 Hamilton & Thalmann 2003, pp. 477–478. 1 2 3 D'Aoust, BG; White, R; Swanson, H; Dunford, RG; Mahoney, J (1982). "Differences in Transient and Steady State Isobaric Counterdiffusion". Report to the Office of Naval Research. http://archive.rubicon-foundation.org/4629. Retrieved 10 January 2010. ↑ Masurel, G; Gutierrez, N; Giacomoni, L (1987). "Hydrogen dive and decompression.". Abstract of the Undersea and Hyperbaric Medical Society, Inc. Annual Scientific Meeting held May 26–30, 1987. The Hyatt Regency Hotel, Baltimore, Maryland. Undersea and Hyperbaric Medical Society, Inc. Retrieved 14 March 2016. 1 2 Doolette, David J; Mitchell, Simon J (June 2003). "Biophysical basis for inner ear decompression sickness". Journal of Applied Physiology. 94 (6): 2145–50. doi:10.1152/japplphysiol.01090.2002 (inactive 2015-01-01). PMID 12562679. Retrieved 10 January 2010. ↑ Moon, Richard E; Kisslo, Joseph (1998). "PFO and decompression illness: An update". South Pacific Underwater Medicine Society Journal. 28 (3). ISSN 0813-1988. OCLC 16986801. Retrieved 31 October 2011. ↑ Staff (May 2014). "Pathophysiology". Medscape Drugs & Diseases. Medscape. pp. Organ involvement associated with decompression sickness. Retrieved 8 March 2016. ↑ Kitano, Motoo (1995). "Pathological Aspects of Decompression Sicknes". 南太平洋海域調査研究報告=Occasional papers, Volume 25. 鹿児島大学. pp. 47–59. Retrieved 8 March 2016. ↑ Brubakk, A. O.; T. S. Neuman (2003). Bennett and Elliott's physiology and medicine of diving (5th Rev ed.). United States: Saunders Ltd. p. 800. ISBN 0-7020-2571-2. ↑ Gernhardt, ML (2006). Lang, MA; Smith, NE, eds. "Biomedical and Operational Considerations for Surface-Supplied Mixed-Gas Diving to 300 FSW.". Proceedings of Advanced Scientific Diving Workshop. Washington, DC: Smithsonian Institution. Retrieved 21 October 2013. ↑ Mouret, GML (2006). "Obesity and diving.". Journal of the South Pacific Underwater Medicine Society. Victoria, Australia: South Pacific Underwater Medicine Society. Retrieved 8 March 2016. ↑ Bookspan, J (May 2003). "Detection of endogenous gas phase formation in humans at altitude". Medicine & Science in Sports & Exercise Suppl. 35 (5,): S164. doi:10.1097/00005768-200305001-00901. Retrieved 7 May 2012. 1 2 3 4 5 Goldman, Saul (19 April 2007). "A new class of biophysical models for predicting the probability of decompression sickness in scuba diving". Journal of Applied Physiology. 103 (2): 484–493. doi:10.1152/japplphysiol.00315.2006. ↑ Kuch, Benjamin; Buttazzo, Giorgio; Sieber, Arne (2011). "Bubble model based decompression algorithm optimised for implementation on a low power microcontroller" (PDF). International Journal of the Society for Underwater Technology, Vol 29, No 4. Society for Underwater Technology. pp. 195–202. doi:10.3723/ut.29.195. Retrieved 14 March 2016. 1 2 Gorman, Desmond F; Pearce, A; Webb, RK (1988). "Dysbaric illness treated at the Royal Adelaide Hospital 1987, a factorial analysis". South Pacific Underwater Medicine Society Journal. 18 (3): 95–101. 1 2 Gorman, Des F (1989). "Decompression tables: their use and problems". South Pacific Underwater Medicine Society Journal. 19 (3): 111–113. Retrieved 31 October 2011. 1 2 Bühlmann Albert A. (1984). Decompression–Decompression Sickness. Berlin New York: Springer-Verlag. ISBN 0-387-13308-9. 1 2 Blogg, S.L. ; M.A. Lang; A. Møllerløkken, eds. (2012). "Proceedings of the Validation of Dive Computers Workshop.". European Underwater and Baromedical Society Symposium, August 24, 2011. Gdansk. Trondheim: Norwegian University of Science and Technology. Retrieved 7 March 2013. ↑ "Dive Computers and Diving Simulations". LogoDiving. Retrieved 11 March 2016. 1 2 3 Maiken, Eric (1995). "Part I: background and theory. Bubble physics". Bubble Decompression Strategies. Retrieved 11 March 2016. 1 2 3 4 Wienke, BR (1989). "Tissue gas exchange models and decompression computations: a review". Undersea and Hyperbaric Medical Society, Inc. PMID 2648656. Retrieved 7 March 2016. 1 2 Baker, Erik (1998). "Understanding M-values". Immersed. 3 (3): 23–27. 1 2 3 4 Anttila, Matti. "Gradient Factors". Retrieved 2 May 2012. 1 2 3 4 5 6 LeMessurier and Hills. (1965) Decompression Sickness. A thermodynamic approach arising from a study on Torres Strait diving techniques. Hvalradets Skrifter, Nr. 48, 54–84. 1 2 3 Boycott, AE; Damant, GCC; Haldane, John Scott (1908). "Prevention of compressed air illness". Journal of Hygiene. 8 (3): 342–443. doi:10.1017/S0022172400003399. PMC 2167126 . PMID 20474365. Retrieved 30 May 2010. ↑ Workman, Robert D (1957). "Calculation of air saturation decompression tables". Navy Experimental Diving Unit Technical Report. NEDU-RR-11-57. Retrieved 31 October 2011. ↑ Kindwall, Eric P; Baz, A; Lightfoot, EN; Lanphier, Edward H; Seireg, A (1975). "Nitrogen elimination in man during decompression". Undersea Biomedical Research. 2 (4): 285–297. ISSN 0093-5387. OCLC 2068005. PMID 1226586. Retrieved 31 October 2011. 1 2 Berghage, TE (1978). "Decompression Theory.". Department of Defense and the Defense Technical Information Center. Retrieved 8 March 2016. ↑ Lang, Michael A; Vann, Richard D (1991). Proceedings of the AAUS Repetitive Diving Workshop. Duke University, Durham, NC: American Academy of Underwater Sciences. p. 339. Retrieved 31 October 2011. 1 2 3 Doolette David J (2005). "Development and testing of deterministic and probabilistic decompression models". South Pacific Underwater Medicine Society Journal. 35 (1). Retrieved 10 January 2012. 1 2 Bennett, Peter B; Alessandro Marroni; Frans J. Cronjé (2004). "Deep Stops: Can Adding Half the Depth of A Safety Stop Build in Another Safety Margin?". Alert Diver. Divers Alert Network (May/June 2004). 1 2 3 Denoble, Petar (Winter 2010). "Deep stops". Alert Diver. Diver Alert Network. Retrieved 3 August 2015. ↑ "Decoweenie Manual" (PDF). decoweenie.com. Retrieved 26 September 2008. 1 2 Pyle, Richard L (1997). "The importance of deep safety stops: Rethinking ascent patterns from decompression dives". South Pacific Underwater Medicine Society Journal (reprinted from: Deep Tech). 27 (2). Retrieved 31 October 2011. ↑ Pyle, Richard L (27 September 2007). "Deep Decompression Stops". Bishop Museum. Retrieved 9 September 2009. ↑ Baker, Erik C. "Clearing Up The Confusion About 'Deep Stops'" (PDF). Retrieved 4 August 2015. 1 2 3 Goldman, Saul; Goldman, Ethel (2010). "Coming soon to a Dive Computer near you" (PDF). Alert Diver (European edition). Roseto degli Abruzzi, Italy: DAN Europe (4th quarter, 2010): 4–8. ↑ Goldman, Saul; Goldman, Ethel (2014). "To stop or not to stop and why?" (PDF). Alert Diver. DAN South Africa. 6 (2): 34–37. ISSN 2071-7628. Retrieved 10 September 2014. ↑ Goldman, Saul (23 September 2013). "How SAUL relates to the PADI dive tables". Modern decompression. Retrieved 10 September 2014. 1 2 Kot, Jacek; Sicko, Zdzislaw; Doboszynski, Tadeusz (2015). 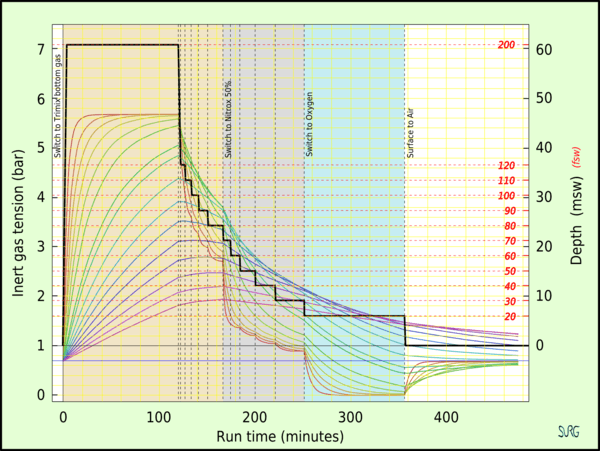 "The Extended Oxygen Window Concept for Programming Saturation Decompressions Using Air and Nitrox" (PDF). PLoS ONE 10(6): e0130835. pp. 1–20. doi:10.1371/journal.pone.0130835. Retrieved 13 May 2016. ↑ Eckenhoff, R.G. ; Osborne, SF; Parker, JW; Bondi, KR (1986). "Direct ascent from shallow air saturation exposures". Undersea and Hyperbaric Medical Society, Inc. PMID 3535200. Retrieved 5 April 2016. ↑ Vann, R. D. (March 1984). "Decompression from Saturation Dives". Proceedings of the 3rd annual Canadian Ocean Technology Congress. Toronto, Canada. pp. 175–186. Retrieved 5 April 2016. ↑ Doboszynski, T; Sicko, Z; Kot, J (2012). "Oxygen-driven decompression after air, nitrox, heliox and trimix saturation exposures". Journal of the Undersea and Hyperbaric Medical Society. Undersea and Hyperbaric Medicine, Inc. Retrieved 5 April 2016. ↑ Staff (April 2009). NORSOK Standard U-100 : Manned underwater operations (3rd ed.). Lysaker, Norway: Standards Norway. ↑ Flook, Valerie (2004). Excursion tables in saturation diving - decompression implications of current UK practice RESEARCH REPORT 244 (PDF). Aberdeen United Kingdom: Prepared by Unimed Scientific Limited for the Health and Safety Executive. ISBN 0 7176 2869 8. Retrieved 27 November 2013. ↑ Hoffman, D.C.; Yount, DE (1985). "Tiny bubble helium decompression tables.". Abstract of the Undersea and Hyperbaric Medical Society, Inc. Annual Scientific Meeting. Undersea and Hyperbaric Medical Society, Inc. Retrieved 5 April 2016. ↑ Staff. "About DAN Research". DAN Europe website. DAN Europe. Retrieved 13 February 2016. ↑ Staff. "Send your Dive Profile". DAN Europe website. DAN Europe. Retrieved 13 February 2016. ↑ Staff. "Become a DAN Research Diver". DAN Europe website. DAN Europe. Retrieved 13 February 2016. ↑ Staff. "Our Projects". DAN Europe website. Retrieved 13 February 2016. ↑ Staff (2002). Paul Williams, ed. The Diving Supervisor’s Manual (IMCA D 022 May 2000, incorporating the May 2002 erratum ed.). Carlyle House, 235 Vauxhall Bridge Road, London SW1V 1EJ, UK: International Marine Contractors' Association. ISBN 1-903513-00-6. Hamilton, Robert W; Thalmann, Edward D (2003). "10.2: Decompression Practice". In Brubakk, Alf O; Neuman, Tom S. Bennett and Elliott's physiology and medicine of diving (5th Revised ed.). United States: Saunders. pp. 455–500. ISBN 0-7020-2571-2. OCLC 51607923. Huggins, Karl E. (1992). "Dynamics of decompression workshop". Course taught at the University of Michigan. Retrieved 10 January 2012. Thalmann, E. D. (1984). "Phase II testing of decompression algorithms for use in the U.S. Navy underwater decompression computer". Navy Exp. Diving Unit Res. Report. 1–84. Retrieved 16 March 2008. Thalmann, E. D. (1985). "Development of a Decompression Algorithm for Constant Oxygen Partial Pressure in Helium Diving". Navy Exp. Diving Unit Res. Report. 1–85. Retrieved 16 March 2008. US Navy (2008). US Navy Diving Manual, 6th revision. United States: US Naval Sea Systems Command. Retrieved 15 June 2008. Wienke, Bruce R; O'Leary, Timothy R (13 February 2002). "Reduced gradient bubble model: Diving algorithm, basis and comparisons" (PDF). Tampa, Florida: NAUI Technical Diving Operations. Retrieved 25 January 2012. Yount, DE (1991). Hans-Jurgen, K; Harper Jr, DE, eds. "Gelatin, bubbles, and the bends". International Pacifica Scientific Diving..., (Proceedings of the American Academy of Underwater Sciences Eleventh Annual Scientific Diving Symposium held 25–30 September 1991. University of Hawaii, Honolulu, Hawaii). Retrieved 25 January 2012. Ball, R; Himm, J; Homer, LD; Thalmann, ED (1995). "Does the time course of bubble evolution explain decompression sickness risk?". Undersea and Hyperbaric Medicine. 22 (3): 263–280. ISSN 1066-2936. PMID 7580767. Gerth, Wayne A; Doolette, David J. (2007). "VVal-18 and VVal-18M Thalmann Algorithm – Air Decompression Tables and Procedures". Navy Experimental Diving Unit, TA 01-07, NEDU TR 07-09. Retrieved 27 January 2012. Lippmann, John; Mitchell, Simon (2005). Deeper into Diving (2nd ed.). Melbourne, Australia: J L Publications. ISBN 0-9752290-1-X. Parker, E. C.; S.S. Survanshi; P.K. Weathersby & E.D. Thalmann (1992). "Statistically Based Decompression Tables VIII: Linear Exponential Kinetics". Naval Medical Research Institute Report. 92-73. Retrieved 16 March 2008. Powell, Mark (2008). Deco for Divers. Southend-on-Sea: Aquapress. ISBN 1-905492-07-3.